AS FEATURED ON FINE LIVING CHANNEL . This is a peaceful Spanish Mission style home on a spectacular site with a large, private pool in the foothills of Santa Barbara. It has magnificent views, wonderful sunsets, and a tropical landscape that gives an exotic resort feeling. The property is at the end of a private road with no through traffic. This is a family home of design professionals. With its tree house, pool and swings it is an ideal place for families. However because of the residential neighborhood the property it is not suitable for loud groups wanting to party. Mission Santa Barbara is only one and one-half miles away. 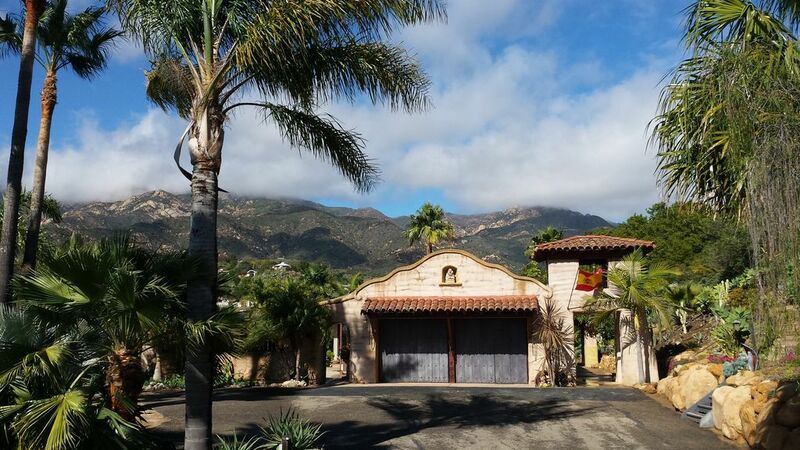 It is less than ten minutes from downtown Santa Barbara which is a very sophisticated town in the Spanish Colonial style; a beautiful town to walk in. There are theaters, many cinemas, and the type of restaurants and shops one usually finds only in large international cities. This artistic house is light, open, and comfortable. The combined kitchen/dining room is large, 26 feet x 16 feet. The adjacent poolside dining area is an ideal place to watch the sunsets or enjoy lunch sitting in swimsuits in the warm sunshine. The large living room, 20 feet x 25 feet, has a wood burning fireplace and wonderful mountain views. There is a home office and wireless internet. No smoking and no pets, please. The Santa Barbara Botanic Gardens are within walking distance, as are many hiking trails. Keywords: Private, tropical, views, large pool. Large 24 x 18 with views and fireplace.